Program Will Provide Citizens With The Tools They Need To Be Ready And Able To Help Their Families And Neighbors During Emergencies. Bethpage, NY - February 22, 2014 - Governor Andrew M. Cuomo today attended an event in Nassau County for the Citizen Preparedness Corps Training Program, which will train approximately 100,000 New Yorkers during 2014 in the proper preparation for emergencies or disasters. The program seeks to provide citizens with the tools and resources to prepare for emergencies and disasters, respond accordingly, and recover as quickly as possible to pre-disaster conditions. Governor Cuomo also recently announced the launch of a new website www.prepare.ny.gov, to serve as the digital home for the Citizen Preparedness Corps community. The website will offer information about additional trainings, disaster preparedness tips, and ways to volunteer your skills in the event of a disaster. An outpouring of volunteers attended today’s Citizen Preparedness Corps training session, with attendance of approximately 575 people in Nassau County. The trainings, along with future ones, were led by the New York National Guard who worked with experts from the Division of Homeland Security and Emergency Services’ Office of Emergency Management and Office of Fire Prevention and Control, and local county emergency management personnel. Brigadier General Raymond F. Shields, who also attended the training, said "We are pleased to continue training the many volunteers in this important emergency preparedness program. The men and women of the New York Army and Air National Guard are honored to be part of the Governor's program to provide New Yorkers with the tools and resources to better handle emergencies and disasters. Our Soldiers and Airmen understand the importance of being equipped to assist when disasters strikes, and it is important that we share that knowledge and training throughout our communities." Jerome M. Hauer, Commissioner, NYS Division of Homeland Security and Emergency Services said, “Governor Cuomo has made emergency preparedness one of his highest priorities as we face the new reality of extreme weather, and for many that preparedness begins in their own homes. I wholeheartedly support his decisive and hands-on strategy for responding to the often very destructive consequences of a natural disaster. Community members are the first to be affected and typically the first to be on the scene in face of such challenges. It is critical that we provide them with the most practical and efficient preparation, so that when an emergency arises they are well positioned to protect their families and fellow neighbors. This training will prove to be fundamental to future disaster relief efforts. 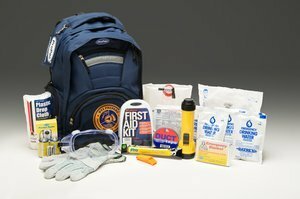 Each volunteer or family received a Citizen Preparedness Corps Response Kit that contains key items to assist them in the immediate aftermath of a disaster. As an individual, a family member, and member of their community, it is essential that citizens take a few basic steps to be prepared; their quality of life and their loved ones may depend on it. Often during an emergency, electricity, heat, air conditioning or telephone service may not work. Citizens should be prepared to make it on their own for at least 7-10 days, maybe longer. Ask Me Elyse: Who Do You Choose As A Houseguest If You Have A Big Event And Limited Space? Subject: LongIsland.com - Your Name sent you Article details of "Governor Cuomo Attends Bethpage Citizen Preparedness Corps Training Program Event"